Vous pouvez consulter en ligne nos publications via cet outil de recherche. Entrez les informations désirées dans les champs correspondants pour consulter la totalité de nos publications. C. M. Morin, J. D. Edinger, A. D. Krystal, D. J. Buysse, S. Beaulieu-Bonneau, H. Ivers (2016). Sequential psychological and pharmacological therapies for comorbid and primary insomnia: study protocol for a randomized controlled trial. Trials, 17, 118. J. Savard, H. Ivers, M. H. Savard, C. M. Morin (2016). Long-term effects of two formats of cognitive-behavioral therapy for insomnia comorbid with breast cancer. Sleep, 39, 813-823. L. Palagini, U. Faraguna, M. Mauro, A. Gronchi, C. M. Morin, D. Riemann (2016). Association between stress-related sleep reactivity and cognitive processes in insomnia disorder and insomnia subgroups: Preliminary results. Sleep Medicine, 19, 101-107. L. Palagini, R. M. Bruno, P. Cheng, M. Mauri, S. Taddei, L. Ghiadoni, C. L. Drake, C. M. Morin (2016). Relationship between insomnia symptoms, perceived stress and coping strategies in subjects with arterial hypertension: Psychological factors may play a modulating role. Sleep Medicine, 19, 108-115. D. C. Jarrin, I. Y. Chen, H. Ivers, M. Lamy, A. Vallieres, C. M. Morin (2016). Nocturnal heart rate variability in patients treated with cognitive behavioral therapy for insomnia. Health Psychology, 35, 638-641. P. Eidelman, L. Talbot, H. Ivers, L. Belanger, C. M. Morin, A. G. Harvey (2016). Change in dysfunctional beliefs about sleep in behavior therapy, cognitive therapy, and cognitive behavior therapy for insomnia. Behavior Therapy, 47, 102-115. J. Savard, H. Ivers, M. H. Savard, C. M. Morin (2015). Cancer treatments and their side effects are associated with aggravation of insomnia: Results of a longitudinal study. Cancer, 121, 1703-1711. M-C. Ouellet, S. Beaulieu-Bonneau, C. M. Morin (2015). Sleep-wake disturbances after traumatic brain injury. The Lancet Neurology, 14, 746-757. C. M. Morin, C. L. Drake, A. G. Harvey, A. D. Krystal, R. Manber, D. Riemann, K. Spiegelhader (2015). Insomnia disorder. Nature Reviews Disease Primers, 1, 1-18. C. M. Morin (2015). Cognitive behavioral therapy for chronic insomnia: State of the science versus current clinical practices. Annals of Internal Medicine, 163, 236-237. P-Y. Chen, C-M. Yang, C. M. Morin (2015). Validating the cross-cultural factor structure and invariance property of the Insomnia Severity Index: Evidence based on ordinal EFA and CFA. Sleep Medicine, 16, 598-603. S. Beaulieu-Bonneau, E. Fortier-Brochu, H. Ivers, C. M. Morin (2015). Attention following traumatic brain injury: Neuropsychological and driving simulator data, and association with sleep, sleepiness, and fatigue. Neuropsychological rehabilitation , 24, 1-23. A. Vallieres, A. Azaiez, V. Moreau, M. LeBlanc, C. M. Morin (2014). Insomnia in shift work. Sleep Medicine, 15, 1440-1448. J. Savard, H. Ivers, M. H. Savard, C. M. Morin (2014). Is a video-based cognitive behavioral therapy for insomnia as efficacious as professionally administered treatment in breat cancer? Results of a randomized controlled trial. Sleep, 37, 1305-1314. C. M. Morin, S. Beaulieu-Bonneau, H. Ivers, A. Vallieres, B. Guay, J. Savard, C. Merette (2014). Speed and trajectory of changes of insomnia symptoms during acute treatment with cognitive-behavioral therapy, singly and combined with medication. Sleep Medicine, 15, 701-707. J. MacFarlane, C. M. Morin, J. Montplaisir (2014). Hypnotics in insomnia: the experience of zolpidem. Clinical Therapeutics, 36, 1676-1701. D. C. Jarrin, I. Y. Chen, H. Ivers, C. M. Morin (2014). The role of vulnerability in stress-related insomnia, social support and coping styles on incidence and persistence of insomnia. Journal of Sleep Research, 23, 681-688. A. G. Harvey, L. Belanger, L. Talbot, P. Eidelman, S. Beaulieu-Bonneau, E. Fortier-Brochu, H. Ivers, M. Lamy, K. Hein, A. Soehner, C. Merette, C. M. Morin (2014). Comparative efficacy of behavior therapy, cognitive therapy, and cognitive behavior therapy for chronic insomnia: A randomized controlled trial. Journal of Consulting and Clinical Psychology, 82, 670-683. B. Guay, C. M. Morin (2014). L'insomnie. Quoi de neuf dans le DSM-5?. Le Médecin du Québec, 49, 33-37. C. B. Miller, C. A. Espie, D. R. Epstein, L. Friedman, C. M. Morin, W. R. Pigeon, A. J. Spielman, S. D. Kyle (2014). The evidence base of sleep restriction therapy for treating insomnia disorder. Sleep Medicine Reviews, 18, 415-424. E. Fortier-Brochu, C. M. Morin (2014). Cognitive impairment in individuals with insomnia: Clinical significance and correlates. Sleep, 37, 1787-1798. V. Moreau, N. Rouleau, C. M. Morin (2014). Sleep of children with attention deficit hyperactivity disorder: Actigraphic and parental reports. Behavioral Sleep Medicine, 12, 69-83. Y. M. Cho, M. L. Song, C. M. Morin (2014). Validation of a Korean version of the insomnia severity index. Journal of Clinical Neurology, 10, 210-215. C. M. Morin, M. LeBlanc, H. Ivers, L. Belanger, C. Merette, J. Savard, D. C. Jarrin (2014). Monthly fluctuations of insomnia symptoms in a population-based sample. Sleep, 37, 319-326. C. H. Bastien, I. Turcotte, G. St-Jean, C. M. Morin, J. Carrier (2013). Information processing varies between insomnia types: Measures of N1 and P2 during the night. Sleep, 11, 319-326. C. Gagnon, L. Belanger, H. Ivers, C. M. Morin (2013). Validation of the Insomnia Severity Index in primary care. Journal of the American Board of Family Medicine, 11, 56-72. A. G. Harvey, A. Soehner, T. Lombrozo, L. Belanger, J. Rifkin, C. M. Morin (2013). 'Folk theories' about the causes of insomnia. Cognitive therapy and research, 37, 1048-1057. V. Moreau, N. Rouleau, C. M. Morin (2013). Sleep, attention, and executive functioning in children with Attention-Deficit/Hyperactivity Disorder. Archives of Clinical Neuropsychology, 37, 692-699. C. M. Morin, D. C. Jarrin (2013). Epidemiology of insomnia: Prevalence, course, risk factors, and public health burden. Sleep Medicine Clinics, 8, 281-297. C. M. Morin, D. C. Jarrin (2013). Insomnia and healthcare-seeking behaviors: Impact of case definitions, comorbidity, sociodemographic, and cultural factors. Sleep Medicine, 14, 808-809. J. St-Amand, M. D. Provencher, L. Belanger, C. M. Morin (2013). Sleep disturbances in bipolar disorder during remission. Journal of Affective Disorders, 146, 112-119. F. P. Thorndike, L. M. Ritterband, L. A. Gonder-Frederick, H. R. Lord, K. L. Ingersoll, C. M. Morin (2013). A randomized controlled trial of an Internet intervention for adults with insomnia: Effects on comorbid psychological and fatigue symptoms. Journal of Clinical Psychology, 69, 1078-1093. C. E. Carney, D. J. Buysse, S. Ancoli-Israel, J. D. Edinger, A. D. Krystal, K. L. Lichstein, C. M. Morin (2012). The consensus sleep diary: Standardizing prospective sleep self-monitoring. Sleep, 35, 287-302. M. M. Ohayon, D. Riemann, C. M. Morin, C. F. III. Reynolds (2012). Hierarchy of insomnia criteria based on daytime consequences. Sleep Medicine, 13, 52-57. L. Belanger, M. LeBlanc, C. M. Morin (2012). Cognitive behavioral therapy for insomnia in older adults. Cognitive and Behavioral Practice, 19, 101-115. S. Beaulieu-Bonneau, C. M. Morin (2012). Sleepiness and fatigue following traumatic brain injury. Sleep Medicine, 13, 598-605. E. Fortier-Brochu, S. Beaulieu-Bonneau, H. Ivers, C. M. Morin (2012). Insomnia and daytime cognitive performance: A meta-analysis. Sleep Medicine Reviews, 16, 83-94. J.-M. Boivert, R. Ladouceur, M. Loranger, C. M. Morin, M. Pépin, M. D. Provencher, J. Savard (2012). Le transfert des connaissances et la mise en application des traitements psychologiques appuyés empiriquement. Revue Francophone de Clinique Comportementale et Cognitive, 17, 19-32. D. Léger, C. M. Morin, M. Uchiyama, Z. Hakimi, S. Cure, J. Walsh (2012). Chronic insomnia, quality-of-life and utility scores: Comparison with good sleepers in a cross-sectional international survey. Sleep Medicine, 13, 43-51. C. M. Morin, R. Benca (2012). Evaluation and treatment of chronic insomnia. The Lancet, 278, 1-13. D. Forget, C. M. Morin, C. H. Bastien (2011). Role of the spontaneous and evoked K-Complex in individuals with primary insomnia and good sleeper controls. Sleep, 34, 1251-1260. C. M. Morin, G. Belleville, L. Belanger, H. Ivers (2011). The Insomnia Severity Index: Psychometric indicators to detect insomnia cases and evaluate treatment response. Sleep, 34, 601-608. C. M. Morin, M. LeBlanc, L. Belanger, H. Ivers, C. Merette, J. Savard (2011). Prevalence of insomnia and its treatment in Canada. The Canadian Journal of Psychiatry / La Revue canadienne de psychiatrie, 56, 540-548. C. M. Morin, M. LeBlanc, L. Belanger, C. Merette (2011). Epidemiology of insomnia in Canada. The Canadian Journal of Psychiatry / La Revue canadienne de psychiatrie, 56, 540-548. D. Riemann, C. M. Morin, C. F. Reynolds (2011). Das Kapitel Schlafstörungen im DSM-V - ein Zwischenbericht (The Chapter on Sleep Disorders in the DSM-V - An Interim Report). Zeitschrift für Psychiatrie, Psychologie und Psychotherapie, 59, 275-280. J. Savard, H. Ivers, J. Villa, A. Caplette-Gingras, C. M. Morin (2011). Natural course of insomnia comorbid with cancer: An 18-month longitudinal study. Journal of Clinical Oncology, 29, 3590-3596. J. Savard, J. Villa, S. Simard, H. Ivers, C. M. Morin (2011). Feasibility of a self-help program for insomnia comorbid with cancer. Psycho-Oncology, 20, 1013-1019. F. Thorndike, L. M. Ritterband, D. K. Saylor, J. C. Magee, L. A. Gonder-Frederick, C. M. Morin (2011). Validation of the Insomnia Severity Index as a web-based measure. Behavioral Sleep Medicine, 9, 216-223. A. Vallieres, H. Ivers, S. Beaulieu-Bonneau, C. M. Morin (2011). Predictability of sleep in patients with insomnia. Sleep, 34, 609-617. M. Xu, L. Belanger, H. Ivers, B. Guay, J. Zhang, C. M. Morin (2011). Comparison of subjective and objective sleep quality in menopausal and non-menopausal women with insomnia. Sleep Medicine, 12, 65-69. E. Fortier-Brochu, S. Beaulieu-Bonneau, H. Ivers, C. M. Morin (2010). Relations between sleep, fatigue and health-related quality of life in individuals with insomnia. Journal of Psychosomatic Research, 69, 475-483. B. Guay, C. M. Morin (2010). Le traitement pharmacologique de l'insomnie, controverses et réalité. Le médecin du Québec, 45, 67-71. C. M. Morin (2010). Chronic insomnia: Recent advances and innovations in treatment development and dissemination. Canadian Psychology, 51, 31-39. C. M. Morin, L. Belanger, J. Savard, M-C. Ouellet (2010). Le traitement cognitif-comportemental de l'insomnie en contexte de comorbidité. Revue québécoise de psychologie, 31, 33-68. W. T. Riley, P. Mihn, A. Behar, C. M. Morin (2010). A computer device to deliver behavioral interventions for insomnia. Behavioral Sleep Medicine, 8, 2-15. K. Sarsour, D. L. Van Brunt, J. A. Johnston, K. A. Foley, C. M. Morin, J. K. Walsh (2010). Associations of nonrestorative sleep with insomnia, depression, and daytime function. Sleep Medicine, 11, 965-972. K. Sarsour, C. M. Morin, K. Foley, A. Kalsekar, J. K. Walsh (2010). Association of insomnia severity and comorbid medical and psychiatric disorders in a health plan-based sample: Insomnia severity and comorbidities. Sleep Medicine, 69-74. C. E. Carney, J. D. Edinger, C. M. Morin, R. Manber, B. Rybarcyk, E. Stepanski, H. Wright, L. Lack (2010). Examining maladaptive beliefs about sleep across insomnia patient groups. Journal of Psychosomatic Research, 68, 57-65. C. M. Morin, A. Vallieres, B. Guay, H. Ivers, J. Savard, C. Merette, C. Bastien, L. Baillargeon (2009). Cognitive behavioral therapy, singly and combined with medication, for persistent insomnia: a randomized controlled trial. Journal of the American Medical Association, 301, 2005-2015. M. Yang, C. M. Morin, K. Schaefer, G. V. Wallenstein (2009). Interpreting score differences in the Insomnia Severity Index: using health-related outcomes to define the minimally important difference. 25, 2487-94. L. Belanger, G. Belleville, C. M. Morin (2009). Management of hypnotic discontinuation in chronic insomnia. Sleep Medicine Clinics, 583-592. L. R., Jr. Pinto, M. C. Pinto, L. I. Goulart, E. Truksinas, M. V. Rossi, C. M. Morin, S. Tufik (2009). Sleep perception in insomniacs, sleep-disordered breathing patients, and healthy volunteers - An important biologic parameter of sleep. Sleep Medicine, 865-868. M. Daley, C. M. Morin, M. LeBlanc, J. P. Gregoire, J. Savard (2009). The economic burden of insomnia: Direct and indirect costs for individuals with insomnia syndrome, insomnia symptoms, and good sleepers. Sleep, 32, 55-64. P. A. Lanfranchi, M. H. Pennestri, L. Fradette, M. Dumont, C. M. Morin, J. Montplaisir (2009). Nighttime blood pressure in normotensive subjects with chronic insomnia: Implications for cardiovascular risk. Sleep, 32, 760-766. M. Daley, C. M. Morin, M. LeBlanc, J. P. Gregoire, J. Savard, L. Baillargeon (2009). Insomnia and its relationship to health-care utilization, work absenteeism, productivity and accidents. Sleep Medicine, 10, 427-438. C. H. Bastien, G. St-Jean, I. Turcotte, D. Forget, C. M. Morin, J. Carrier (2009). Spontaneous K-complexes in chronic psychophysiological insomnia. Journal of Psychosomatic Research, 67, 117-125. L. M. Ritterband, F. P. Thorndike, L. A. Gonder-Frederick, J. C. Magee, E. T. Bailey, D. K. Saylor, C. M. Morin (2009). Efficacy of an internet-based behavioral intervention for adults with insomnia. Arch Gen Psychiatry, 66, 692-8. M. LeBlanc, C. Merette, J. Savard, H. Ivers, L. Baillargeon, C. M. Morin (2009). Incidence and risk factors of insomnia in a population-based sample. Sleep, 32, 1027-37. V. Moreau, L. Belanger, G. Begin, C. M. Morin (2009). Insomnia, sleepiness, and depression in adolescents living in residential care facilities. Residential Treatment for Children & Youth, 26, 21-35. C. M. Morin, L. Belanger, M. LeBlanc, H. Ivers, J. Savard, C. A. Espie, C. Merette, L. Baillargeon, J. P. Gregoire (2009). The natural history of insomnia: A population-based 3-year longitudinal study. Archives of Internal Medicine, 169, 447-453. M. M. Sanchez-Ortuno, L. Belanger, H. Ivers, M. LeBlanc, C. M. Morin (2009). The use of natural products for sleep: A common practice?. Sleep Medicine, 10, 982-987. J. R. Davidson, A. Aime, H. Ivers, C. M. Morin (2009). Characteristics of individuals with insomnia who seek treatment in a clinical setting versus those who volunteer for a randomized controlled trial. Behavioral Sleep Medicine, 7, 37-52. T. Munezawa, C. M. Morin, Y. Inoue (2009). Development of the Japanese version of the Dysfunctional Beliefs and Attitudes about Sleep (Japanese). Japanese Journal of Sleep Medicine, 3, 396-403. C. H. Bastien, G. St-Jean, I. Turcotte, C. M. Morin, M. Lavallee, J. Carrier (2009). Sleep spindles in chronic psychophysiological insomnia. Journal of Psychosomatic Research, 66, 59-65. T. Munezawa, C. M. Morin, Y. Inoue (2009). Development of the Japanese version of the Insomnia Severity Index (Japanese). Japanese Journal of Psychiatry Treatment, 24, 219-225. J. Savard, J. Villa, H. Ivers, S. Simard, C. M. Morin (2009). Prevalence, natural course and risk factors of insomnia comorbid with cancer over a 2-month period. Journal of Clinical Oncology, 27, 5233-5239. G. Belleville, C. M. Morin (2008). Insomnia. Scholarpedia, 3, 3314. S. Pallesen, B. Bjorvatn, I. H. Nordhus, B. Sivertsen, M. Hjornevik, C. M. Morin (2008). A new scale for measuring insomnia: the Bergen Insomnia Scale. Perceptual and Motor Skills, 107, 691-706. F. P. Thorndike, D. K. Saylor, E. T. Bailey, L. Gonder-Frederick, C. M. Morin, L. M. Ritterband (2008). Development and perceived utility and impact of an intervention for insomnia. E-Journal of Applied Psychology, 4, 32-42. C. H. Bastien, G. St-Jean, C. M. Morin, I. Turcotte, J. Carrier (2008). Chronic psychophysiological insomnia: Hyperarousal and/or inhibition deficits? An ERPs investigation. Sleep, 31, 887-898. G. Belleville, C. M. Morin (2008). Hypnotic discontinuation in chronic insomnia: Impact of psychological distress, readiness to change, and self-efficacy. Health Psychology, 27, 239-248. S. Beaulieu-Bonneau, M. LeBlanc, C. Merette, Y. Dauvilliers, C. M. Morin (2007). Family history of insomnia in a population-based sample. Sleep, 30, 1739-1745. C. M. Morin, A. Vallieres, H. Ivers (2007). Dysfunctional beliefs and attitudes about sleep (DBAS): Validation of a brief version (DBAS-16). Sleep, 30, 1547-1554. S. Beaulieu-Bonneau, E. Fortier-Brochu, C. M. Morin (2007). Prise en charge comportementale de l'insomnie. Médecine du sommeil, 11, 4-10. M-C. Ouellet, C. M. Morin (2007). Efficacy of cognitive-behavioral therapy for insomnia associated with traumatic brain injury: A single-case experimental design. Archives of Physical Medicine and Rehabilitation, 88, 1581-1592. L. Belanger, A. Vallieres, H. Ivers, V. Moreau, G. Lavigne, C. M. Morin (2007). Meta-analysis of sleep changes during placebo administration compared to untreated groups in insomnia treatment trials. Journal of Sleep Research, 16, 77-84. E. Fortier-Brochu, S. Beaulieu-Bonneau, C. M. Morin (2007). Pour ne plus compter les moutons. Cerveau et Psycho, 23, 52-57. L. Belanger, A. Vallieres, H. Ivers, V. Moreau, G. Lavigne, C. M. Morin (2007). Meta-analysis of sleep changes in control groups of insomnia treatment trials. Journal of Sleep Research, 16, 77-84. M. LeBlanc, S. Beaulieu-Bonneau, C. Merette, J. Savard, H. Ivers, C. M. Morin (2007). Psychological and health-related quality of life factors associated with insomnia in a population-based sample. Journal of Psychosomatic Research, 63, 157-66. G. Belleville, C. Guay, B. Guay, C. M. Morin (2007). Hypnotic taper with or without self-help treatment: A randomized clinical trial. Journal of Consulting and Clinical Psychology, 75, 325-335. C. A. Espie, K. M. MacMahon, H. L. Kelly, N. M. Broomfield, N. J. Douglas, H. M. Engleman, B. McKinstry, C. M. Morin, A. Walker, P. Wilson (2007). Randomized clinical effectiveness trial of nurse-administered small-group cognitive behavior therapy for persistent insomnia in general practice. Sleep, 30, 574-584. C. M. Morin (2006). Cognitive behavioral therapy of insomnia. Sleep Medicine Clinics, 1, 375-386. M-C. Ouellet, C. M. Morin (2006). Subjective and objective measures of insomnia in the context of traumatic brain injury: A preliminary study. Sleep Medicine, 6, 486-497. C. M. Morin, R. R. Bootzin, D. J. Buysse, J. D. Edinger, C. A. Espie, K. L. Lichstein (2006). Psychological and behavioral treatment of insomnia: Update of the recent evidence (1998-2004). Sleep, 29, 1398-1414. P. Voyer, R. Verreault, P. N. Mengue, C. M. Morin (2006). Prevalence of insomnia and its associated factors in elderly long-term care residents. Archives of Gerontology and Geriatrics, 42, 1-20. D. J. Buysse, S. Ancoli-Israel, J. D. Edinger, K. L. Lichstein, C. M. Morin (2006). Recommendations for a standard research assessment of insomnia. Sleep, 29, 1155-1173. C. M. Morin, M. LeBlanc, M. Daley, J. P. Gregoire, C. Merette (2006). Epidemiology of insomnia: Prevalence, self-help treatments, consultations, and determinants of help-seeking behaviors. Sleep Medicine, 7, 123-130. L. Belanger, J. Savard, C. M. Morin (2006). Clinical management of insomnia using cognitive therapy. Behavioral Sleep Medicine, 4, 179-198. L. Belanger, A. Vallieres, C. M. Morin (2006). Insomnie et utilisation accrue de somnifères chez les aînés: Problématique et alternative de traitement. Canadian Family Physician / Le Médecin de famille canadien, 52, 968-973. L. Belanger, A. Vallieres, C. M. Morin (2006). [Insomnia and increased use of sleep medication among seniors: Problems and alternative treatment.]. Canadian Family Physician, 52, 968-973. C. M. Morin, L. Belanger, E. Fortier-Brochu (2006). Sommeil, insomnie et psychopathologie. Canadian Psychology / Psychologie canadienne, 47, 245-262. M-C. Ouellet, S. Beaulieu-Bonneau, C. M. Morin (2006). Insomnia in patients with traumatic brain injury: Frequency, characteristics, and risk factors. Journal of Head Trauma Rehabilitation, 21, 199-212. C. M. Morin (2006). Combined therapeutics for insomnia: Should our first approach be behavioral or pharmacological?. Sleep Medicine Clinics, 7 Suppl 1, S15-S19. M-C. Ouellet, C. M. Morin (2006). Fatigue following traumatic brain injury: Frequency, characteristics, and associated factors. Rehabilitation Psychology, 51, 140-149. L. Belanger, C. M. Morin, L. Gendron, F. C. Blais (2005). Presleep cognitive activity and thought control strategies in insomnia. Journal of Cognitive Psychotherapy: An International Quarterly, 19, 19-28. L. Belanger, C. M. Morin, C. Bastien, R. Ladouceur (2005). Self-efficacy and compliance with benzodiazepine taper in older adults with chronic insomnia. Health Psychology, 24, 281-287. C. M. Morin, S. Beaulieu-Bonneau, M. LeBlanc, J. Savard (2005). Self-Help treatment for insomnia: a randomized controlled trial. Sleep, 28, 1319-1327. J. Savard, S. Simard, H. Ivers, C. M. Morin (2005). Randomized study on the efficacy of cognitive-behavioral therapy for insomnia secondary to breast cancer, part I: Sleep and psychological effects. Journal of Clinical Oncology, 23, 6083-6096. C. M. Morin, U. Koetter, C. Bastien, J. C. Ware, V. Wooten (2005). Valerian-hops combination and diphenhydramine for treating insomnia: a randomized placebo-controlled clinical trial. Sleep, 28, 1465-1471. J. Savard, S. Simard, H. Ivers, C. M. Morin (2005). Randomized study on the efficacy of cognitive-behavioral therapy for insomnia secondary to breast cancer, Part II: Immunological effects. Journal of Clinical Oncology, 23, 6097-6106. C. M. Morin, L. Belanger, C. Bastien, A. Vallieres (2005). Long-term outcome after discontinuation of benzodiazepines for insomnia: A survival analysis of relapse. Behaviour Research and Therapy, 43, 1-14. A. Vallieres, H. Ivers, C. H. Bastien, S. Beaulieu-Bonneau, C. M. Morin (2005). Variability and predictability in sleep patterns of chronic insomniacs. Journal of Sleep Research, 14, 447-453. Y. Dauvilliers, C. M. Morin, K. Cervena, B. Carlander, J. Touchon, A. Besset, M. Billiard (2005). Family studies in insomnia. Journal of Psychosomatic Research, 58, 271-278. A. Vallieres, C. M. Morin, B. Guay (2005). Sequential combinations of drug and cognitive behavioral therapy for chronic insomnia: An exploratory study. Behaviour Research and Therapy, 43, 1611-1630. A. Vallieres, B. Guay, C. M. Morin (2004). L'ABC du traitement cognitivo-comportemental de l'insomnie primaire. Le Médecin du Québec, 10, 85-96. A. Vallieres, C. M. Morin, B. Guay, C. H. Bastien, M. LeBlanc (2004). Sequential treatment for chronic insomnia: a pilot study. Behavioral Sleep Medicine, 2, 94-112. L. Belanger, C. M. Morin, F. Langlois, R. Ladouceur (2004). Insomnia and generalized anxiety disorder: Effects of cognitive behavior therapy for GAD on insomnia symptoms. Journal of Anxiety Disorders, 18, 561-571. C. M. Morin, C. Bastien, B. Guay, M. Radouco-Thomas, J. Leblanc, A. Vallieres (2004). Randomized clinical trial of supervised tapering and cognitive behavior therapy to facilitate benzodiazepine discontinuation in older adults with chronic insomnia. The American Journal of Psychiatry, 161, 332-342. C. M. Morin (2004). Cognitive-behavioral approaches to the treatment of insomnia. Journal of Clinical Psychiatry, 65, 33-40. C. H. Bastien, C. M. Morin, M-C. Ouellet, F. C. Blais, S. Bouchard (2004). Cognitive-behavioral therapy for insomnia: Comparison of individual therapy, group therapy, and telephone consultations. Journal of Consulting and Clinical Psychology, 72, 653-659. C. M. Morin, L. Belanger, F. Bernier (2004). Correlates of benzodiazepine use in individuals with insomnia. Sleep Medicine, 5, 457-462. C. M. Morin (2004). Traitement de l'insomnie et autres troubles du sommeil. Psychologie Québec, 21, 18-25. M-C. Ouellet, C. M. Morin (2004). Cognitive-behavioral therapy for the management of insomnia associated with traumatic brain injury: a case study. Archives of Physical Medicine and Rehabilitation, 85, 1298-1302. C. M. Morin (2004). Insomnia treatment: Taking a broader perspective on efficacy and cost-effectiveness issues. Sleep Medicine Reviews, 8, 3-6. M-C. Ouellet, J. Savard, C. M. Morin (2004). Insomnia following traumatic brain injury: a review. Neurorehabilitation Neural Repair, 18, 187-198. J. D. Edinger, M. H. Bonnet, R. R. Bootzin, K. Doghramji, C. M. Dorsey, C. A. Espie, A. O. Jamieson, W. V. McCall, C. M. Morin, E. J. Stepanski (2004). Derivation of research diagnostic criteria for insomnia: Report of an American Academy of Sleep Medicine Work Group. Sleep, 27, 1567-1596. C. H. Bastien, A. Vallieres, C. M. Morin (2004). Precipitating factors of insomnia. Behavioral Sleep Medicine, 2, 50-62. J. Savard, J. R. Davidson, H. Ivers, C. Quesnel, D. Rioux, V. Dupéré, M. Lasnier, S. Simard, C. M. Morin (2004). The association between nocturnal hot flashes and sleep in breast cancer survivors. Journal of Pain and Symptom Management, 27, 513-522. J. Savard, L. Laroche, S. Simard, H. Ivers, C. M. Morin (2003). Chronic insomnia and immune functioning. Psychosomatic Medicine, 65, 211-221. L. Baillargeon, P. Landreville, R. Verreault, J. P. Beauchemin, J. P. Gregoire, C. M. Morin (2003). Discontinuation of benzodiazepines among older insomniac adults treated with cognitive-behavioural therapy combined with gradual tapering: A randomized trial. Canadian Medical Association Journal, 169, 1015-1020. S. Bouchard, C. Bastien, C. M. Morin (2003). Self-efficacy and adherence to cognitive-behavioral treatment of insomnia. Behavioral Sleep Medicine, 1, 187-199. G. Belleville, C. M. Morin (2003). Approches cognitivo-comportementales dans la gestion de l'insomnie secondaire à la douleur chronique. Douleur et Analgésie, 2, 111-116. C. H. Bastien, E. Fortier-Brochu, I. Rioux, M. LeBlanc, M. Daley, C. M. Morin (2003). Cognitive performance and sleep quality in the elderly suffering from chronic insomnia. Relationship between objective and subjective measures. Journal of Psychosomatic Research, 54, 39-49. J. Montplaisir, R. Hawa, H. Moller, C. M. Morin, C. Fortin, J. Matte, L. Reinish, C. Shapiro (2003). Zopiclone and zaleplon vs benzodiazepines in the treatment of insomnia: Canadian consensus statement. Human Psychopharmacology, 18, 29-38. C. H. Bastien, M. LeBlanc, J. Carrier, C. M. Morin (2003). Sleep EEG power spectra, insomnia, and chronic use of benzodiazepines. Sleep, 26, 313-317. A. Vallieres, C. M. Morin (2003). Actigraphy in the assessment of insomnia. Sleep, 26, 902-906. C. M. Morin, C. H. Bastien, D. Brink, T. R. Brown (2003). Adverse effects of temazepam in older adults with chronic insomnia. Human Psychopharmacology, 18, 75-82. C. Quesnel, J. Savard, S. Simard, H. Ivers, C. M. Morin (2003). Efficacy of cognitive-behavioral therapy for insomnia in women treated for nonmetastatic breast cancer. Journal of Consulting and Clinical Psychology, 71, 189-200. C. M. Morin (2003). Measuring outcomes in randomized clinical trials of insomnia treatments. Sleep Medicine Reviews, 7, 263-279. C. M. Morin, S. Rodrigue, H. Ivers (2003). Role of stress, arousal, and coping skills in primary insomnia. Psychosomatic Medicine, 65, 259-267. G. Belleville, L. Belanger, C. M. Morin (2003). [Cognitive-behavioral treatment of insomnia and its use during withdrawal of hypnotic medication]. Sante mentale au Quebec, 28, 87-101. B. Guay, C. M. Morin (2002). Comment évaluer un problème d'insomnie. Le Médecin du Québec, 37, 97-109. M-C. Ouellet, C. M. Morin (2002). Gérer ses insomnies et retrouver ses nuits. Science et Vie, 220, 106-113. C. M. Morin (2002). Contributions of cognitive-behavioral approaches to the clinical management of insomnia. The Primary Care Companion to The Journal of Clinical Psychiatry, 4, 21-26. C. M. Morin, F. Blais, J. Savard (2002). Are changes in beliefs and attitudes about sleep related to sleep improvements in the treatment of insomnia?. Behaviour Research and Therapy, 40, 741-752. A. Gagné, C. M. Morin (2001). Predicting treatment response in older adults with insomnia. Journal of Clinical Geropsychology, 7, 131-143. F. C. Blais, C. M. Morin, A. Boisclair, V. Grenier, B. Guay (2001). L'insomnie: Prévalence et traitement chez les patients consultant en médecine générale. Canadian Family Physician, 47, 759-767. J. Savard, C. M. Morin (2001). Insomnia in the context of cancer: a review of a neglected problem. Journal of Clinical Oncology, 19, 895-908. J. Savard, S. Simard, J. Blanchet, H. Ivers, C. M. Morin (2001). Prevalence, clinical characteristics, and risk factors for insomnia in the context of breast cancer. Sleep, 24, 583-590. C. M. Morin, M. Daley, M-C. Ouellet (2001). Insomnia in Adults. Current Treatment Options in Neurology, 3, 9-18. C. M. Morin (2001). Vulnérabilité psychologique à l'insomnie. Revue Neurologique, 157, 67-70. C. M. Morin, B. Guay (2001). L'insomnie: nature et traitement. L'Actualité médicale, 22 (suppl. ), 1-7. C. H. Bastien, A. Vallieres, C. M. Morin (2001). Validation of the Insomnia Severity Index as an outcome measure for insomnia research. Sleep Medicine, 2, 297-307. A. M. Gagné, C. M. Morin (2000). Effets des benzodiazépines sur la performance cognitive et psychomotrice des personnes âgées souffrant d'insomnie.. Canadian Journal on Aging / La revue canadienne du vieillissement, 19, 479-493. D. Coradeschi, C. Novara, C. M. Morin (2000). Dysfunctional Beliefs and Attitudes about Sleep Questionnaire: Italian version and reliability analysis. Psicoterapia Cognitiva e Comportamentale, 6, 33-44. C. M. Morin (2000). The nature of insomnia and the need to refine our diagnostic criteria. Psychosomatic Medicine, 62, 483-485. C. H. Bastien, C. M. Morin (2000). Familial incidence of insomnia. Journal of Sleep Research, 9, 49-54. C. M. Morin (2000). Le rôle des interventions comportementales dans le traitement clinique de l'insomnie. Le Clinicien (suppl. ), novembre, 16-18. A. Vignola, C. Lamoureux, C. H. Bastien, C. M. Morin (2000). Effects of chronic insomnia and use of benzodiazepines on daytime performance in older adults. Journal of Gerontology: Psychological sciences, 55, P54-62. M. J. Sateia, K. Doghramji, P. J. Hauri, C. M. Morin (2000). Evaluation of chronic insomnia. An American Academy of Sleep Medicine review. Sleep, 23, 243-308. C. M. Morin, C. Colecchi, J. Stone, R. Sood, D. Brink (1999). Behavioral and pharmacological therapies for late-life insomnia: A randomized controlled trial. Journal of the American Medical Association, 281, 991-999. C. H. Bastien, C. M. Morin (1999). Nonpharmacological therapies for treating insomnia. Current Practice of Medicine, 2, 249-251. C. M. Morin, V. Mimeault, A. Gagné (1999). Nonpharmacological treatment of late-life insomnia. Journal of Psychosomatic Research, 46, 103-116. V. Mimeault, C. M. Morin (1999). Self-help treatment for insomnia: Bibliotherapy with and without professional guidance. Journal of Consulting and Clinical Psychology, 67, 511-519. C. M. Morin, P. J. Hauri, C. A. Espie, A. J. Spielman, D. J. Buysse, R. R. Bootzin (1999). Nonpharmacologic treatment of chronic insomnia. An American Academy of Sleep Medicine review. Sleep, 22, 1134-1156. J. K. Walsh, R. M. Benca, M. Bonnet, D. J. Buysse, P. J. Hauri, J. Kiley, A. Monjan, C. M. Morin, J.R. Ricca, S. Rogus, T. Roth, R.D. Simon (1999). Insomnia : Assessment and management in primary care. National Heart, Lung, and Blood Institute Working Group on Insomnia.. American Family Physician, 59, 3029-3038. B. Guay, C. M. Morin (1998). Le sevrage chez les utilisateurs à long terme de benzodiazépines à dose thérapeutique. Le MÃ©decin du QuÃ©bec, 33, 93-98. C. M. Morin, D. Gibson, J. Wade (1998). Self-reported sleep and mood disturbance in chronic pain patients. The Clinical Journal of Pain, 14, 311-314. F. C. Blais, L. Gendron, V. Mimeault, C. M. Morin (1997). Assessment of insomnia: Validation of three questionnaires. Encephale, 23, 447-453. C. M. Morin, J. C. Ware (1996). Sleep and psychopathology. Applied and Preventive Psychology, 5, 211-224. C. M. Morin, V. Wooten (1996). Psychological and pharmacological approaches to treating insomnia: Critical issues in assessing their separate and combined effects. Clinical Psychology Review, 16, 521-542. C. M. Morin (1996). Introduction: Psychosocial and pharmacological treatments in behavioral medicine. Clinical Psychology Review, 16, 453-456. C. M. Morin, C. Colecchi, D. Brink, M. Astruc, J. Mercer, S. Remsberg (1995). How blind are double-blind placebo-controlled trials of benzodiazepine hypnotics?. Sleep, 18, 240-245. R. P. Hart, C. M. Morin, A. M. Best (1995). Neuropsychological performance in elderly insomnia patients. Aging and Cognition, 2, 268-278. C. M. Morin, C. A. Colecchi, W. D. Ling, R. K. Sood (1995). Cognitive behavior therapy to facilitate benzodiazepine discontinuation among hypnotic-dependent patients with insomnia. Behavior Therapy, 26, 733-745. M. Camacho, C. M. Morin (1995). The effect of temazepam on respiration in elderly insomniacs with mild sleep apnea. Sleep, 18, 644-645. C. M. Morin (1994). Dysfunctional beliefs and attitudes about sleep: Preliminary scale development and description. The Behavior Therapist, 163-164. C. M. Morin (1994). Perspectivas psicologicas en el diagnostico y tratamiento del insomnio. Psicologia Conductual, 2, 261-282. C. M. Morin, J. P. Culbert, S. M. Schwartz (1994). Nonpharmacological interventions for insomnia: A meta-analysis of treatment efficacy. American Journal of Psychiatry, 151, 1172-1180. J. Stone, C. M. Morin, R. P. Hart, S. Remsberg, J. Mercer (1994). Neuropsychological functioning in older insomniacs with or without obstructive sleep apnea. Psychology and Aging, 9, 231-236. C. M. Morin, J. Stone, K. McDonald, S. Jones (1994). Psychological management of insomnia: A clinical replication series with 100 patients. Behavior Therapy, 25, 291-309. C. M. Morin, R. A. Kowatch, T. Barry, E. Walton (1993). Cognitive-behavior therapy for late-life insomnia. Journal of Consulting and Clinical Psychology, 61, 137-146. C. M. Morin, J. Stone, D. Trinkle, J. Mercer, S. Remsberg (1993). Dysfunctional beliefs and attitudes about sleep among older adults with and without insomnia complaints. Psychology and Aging, 8, 463-467. E. Sloan, P. J. Hauri, R. R. Bootzin, C. M. Morin, M. Stevenson, C. M. Shapiro (1993). The nuts and bolts of behavioural therapy for insomnia. Journal of Psychosomatic Research, 37, 19-37. P. Lacks, C. M. Morin (1992). Recent advances in the assessment and treatment of insomnia. Journal of Consulting and Clinical Psychology, 60, 586-594. C. M. Morin, B. Gaulier, T. Barry, R. A. Kowatch (1992). Patients' acceptance of psychological and pharmacological therapies for insomnia. Sleep, 15, 302-305. C. M. Morin (1991). [Cognitive and behavioral perspectives in the treatment of chronic insomnia]. Science et Comportement, 21, 273-290. C. M. Morin, R. A. Kowatch, G. O'Shanick (1990). Sleep restriction for the inpatient treatment of insomnia. Sleep, 13, 183-186. C. M. Morin, R. A. Kowatch, J. B. Wade (1989). Behavioral management of sleep disturbances secondary to chronic pain. Journal of Behavioral Therapy and Experimental Psychiatry, 20, 295-302. C. M. Morin, S. E. Gramling (1989). Sleep patterns and aging: Comparison of older adults with and without insomnia complaints. Psychology and Aging, 4, 290-294. C. M. Morin, N. H. Azrin (1988). Behavioral and cognitive treatments of geriatric insomnia. Journal of Consulting and Clinical Psychology, 56, 748-753. C. M. Morin, J. A. Kwentus (1988). Behavioral and pharmacological treatments for insomnia. Annals of Behavioral Medicine, 10, 91-100. C. M. Morin, N. H. Azrin (1987). Stimulus control and imagery training in treating sleep-maintenance insomnia. Journal of Consulting and Clinical Psychology, 55, 260-262. C. M. Morin, S. R. Rapp (1987). Behavioral management of geriatric insomnia. Clinical Gerontologist, 6, 15-23. (1987). Stimulus control and imagery training in treating sleep-maintenance insomnia. Journal of Consulting and Clinical Psychology, 55, 260-262. C. M. Morin, J. D. Edinger (2014). Sleep-wake disorders. Y. Dauvilliers, C. M. Morin (2013). Heritability and genetic factors in chronic insomnia. 227-234. C. M. Morin, E. Fortier-Brochu, S. Beaulieu-Bonneau (2013). Sommeil et insomnie: Mythes et réalités. 121-149. C. M. Morin, J. Savard, M-C. Ouellet (2013). Nature and treatment of insomnia. 318-339. M-C. Ouellet, S. Beaulieu-Bonneau, C. M. Morin (2012). Sleep-wake disturbances. 707-725. L. Belanger, C. M. Morin (2012). L'insomnie chez l'adulte. 155-175. J. D. Edinger, C. M. Morin (2012). Sleep disorders classification and diagnosis. 361-382. C. A. Espie, C. M. Morin (2012). Historical landmarks and current status of sleep research and practice. 1-7. C. M. Morin, C. A. Espie (2012). Overview, emerging trends, and future directions in sleep research and practice. 864-870. M-C. Ouellet, S. Beaulieu-Bonneau, C. M. Morin (2012). Sleep-wake disturbance and fatigue in individuals with traumatic brain injury. 820-845. C. M. Morin (2011). Psychological and behavioral treatments for insomnia I: Approaches and efficacy. 866-883. C. M. Morin, R. M. Benca (2011). Insomnia: Nature, diagnosis, and treatment. 723-746. J. Savard, M. H. Savard, C. M. Morin (2010). Insomnia. 633-669. G. Belleville, C. M. Morin (2010). Insomnia. 826-829. C. M. Morin, L. Belanger (2010). Cognitive therapy for dysfunctional beliefs about sleep and insomnia. 107-118. M-C. Ouellet, S. Beaulieu-Bonneau, C. M. Morin (2010). Sleep following traumatic brain injury. 353-367. G. Lavigne, C. M. Morin, M. C. Carra (2009). The nature of sleep. 3-10. C. M. Morin, L. Belanger (2009). Cognitive-behavioral treatment of insomnia in older adults. 127-139. C. M. Morin, R. M. Benca (2009). Nature and treatment of insomnia. 361-376. C. M. Morin, J. D. Edinger (2008). Sleep/wake disorders. 506-526. M. Daley, S. Beaulieu-Bonneau, C. M. Morin (2007). Public health impact of insomnia and low cost behavioral interventions. 155-174. C. M. Morin, J. D. Edinger (2007). Sleep disorders: Evaluation and diagnosis. 601-632. D. E. Moul, C. M. Morin, D. J. Buysse, C. F. Reynolds, D. J. Kupfer (2007). Treatments for insomnia and restless legs syndrome. 611-640. C. M. Morin (2006). Behavioral treatment of persistent insomnia. 413-429. J. Savard, S. Simard, C. M. Morin (2006). Insomnia. 61-85. C. M. Morin (2005). Psychological and behavioral treatments for insomnia. 726-737. C. M. Morin, J. R. Davidson, J. Savard (2005). Behavioral treatment of insomnia. 160-164. C. M. Morin, M. LeBlanc, M. Daley (2005). Sleep restriction as therapy for insomnia. 475-483. C. Bastien, M-C. Ouellet, E. Fortier-Brochu, C. M. Morin (2005). Primary insomnia. 305-315. C. M. Morin, C. H. Bastien, J. Savard (2003). Current status of cognitive-behavior therapy for insomnia : evidence for treatment effectiveness and feasibility. 262-285. D. J. Buysse, C. M. Morin (2003). Hypnotics. 612-614. C. M. Morin (2003). Treating insomnia with behavioral approaches : Evidence for efficacy, effectiveness, and practicality. 83-95. C. M. Morin (2003). Nature and treatment of primary insomnia. C. M. Morin, D. J. Buysse (2003). Behavioral treatment for insomnia. 661-664. C. M. Morin, J. D. Edinger (2003). Sleep disorders: Evaluation and diagnosis. 583-612. C. M. Morin, J. Savard, M-C. Ouellet, M. Daley (2003). Insomnia: nature, epidemiology and treatment. 317-337. P. D. Nowell, D. J. Buysse, C. M. Morin, C. F. III. Reynolds, D. J. Kupfer (2002). Effective treatments for selected sleep disorders. 593-609. A. Vallieres, M-C. Ouellet, C. M. Morin (2002). Self-help treatment for insomnia. 2, 607-613. J. Savard, C. M. Morin (2002). Insomnia. 523-555. D. J. Buysse, C. M. Morin, C. F. Reynolds (2001). Sleep disorders. 2371-2431. C. M. Morin (2001). Combined treatments of insomnia. 111-129. C. M. Morin, L. Baillargeon, C. Bastien (2000). Discontinuation of sleep medications. 271-296. E. C. Klip, C. M. Morin (2000). Sleep problems. 188-203. C. M. Morin, C. H. Bastien, F. C. Blais, V. Mimeault (2000). Les troubles du sommeil chez les personnes âgées. 77-98. K. Lichstein, C. M. Morin (2000). Treatment overview. 111-124. C. M. Morin, J. Savard, F. Blais (2000). Cognitive therapy of late-life insomnia. 207-230. C. M. Morin, J. D. Edinger (1999). Sleep/wake disorders. 390-409. P. D. Nowell, D. J. Buysse, C. M. Morin, C. F. Reynolds, D. J. Kupfer (1998). Effective treatments for selected sleep disorders. 531-543. C. M. Morin, F. C. Blais, V. Mimeault (1998). Sleep disturbances in late life. 273-299. J. C. Ware, C. M. Morin (1997). Sleep in depression and anxiety. 483-503. C. M. Morin, J. D. Edinger (1997). Sleep disorders: Evaluation and diagnosis. 483-507. D. J. Buysse, C. M. Morin, C. F. III. Reynolds (1996). Sleep Disorders. 1013-1041. D. J. Buysse, C. M. Morin, C. F. III. Reynolds (1995). Sleep disorders. 2397-2453. C. M. Morin, C. Colecchi (1995). Psychological assessment of older adults. 172-191. C. M. Morin, C. Colecchi (1994). Clinical guidelines for the treatment of insomnia. 179-195. C. M. Morin (1990). The healing power of sleep. 54-59. C. M. Morin, S. Gramling (1990). Sleep and chronic pain. 159-185. C. M. Morin, C. A. Espie (2012). Oxford handbook of sleep and sleep disorders..
H. Driver, R. Gottschalk, M. Hussain, C. M. Morin, C. Shapiro, L. Van Zyl (2012). Insomnia in adults and children. C. M. Morin (2009). 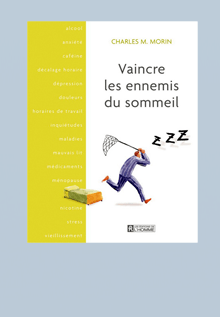 Vaincre les ennemis du sommeil (2ème édition)..
C. M. Morin, C. A. Espie (2003). Insomnia: A clinical guide to assessment and treatment..
K. L. Lichstein, C. M. Morin (2000). Treatment of late-life insomnia..
C. M. Morin (1996). Relief from insomnia..
C. M. Morin (1993). Insomnia: Psychological assessment and management..